Aside from understanding that Canadian residents are taxed on world income in Canadian funds, there are only a few basics you need to know about the marginal tax rate system in Canada. That’s important because these points will help you understand how the next dollars you earn will be taxed. Under our “progressive system of taxation,” you’ll pay more the more you earn, but you may also receive less in tax credits—which are a form of income redistribution. First know that there are two levels of personal income tax: one to the Federal and one to Provincial Governments. Next, every individual has a Tax Free Zone: the Basic Personal Amount, which on the federal return is indexed annually with inflation. The BPA is different for each province, and may differ from the federal amount. Depending on the province, it may or may not be indexed. Other tax deductions and credits available to the individual may increase the Tax Free Zone. Thirdly, understand what tax bracket your taxable income falls into. It can help you make decision like how much money you’ll take out of your RRSP or RRIF this year, or whether to plan to plan a capital disposition this year. Following are the brackets and rates for both 2012, the tax year for which you are filing a tax return now, and for 2013, the tax year for which you will plan to diversify income, split income with family members, defer and time income sources to get the best tax results! It’s Your Money, Your Life. Every dollar saved by claiming all the tax credits and deductions you are entitled to is another dollar that is freed to be invested to create wealth. When you plan in advance to pay the least possible tax rates on income and capital by taking advantage of your tax filing opportunities, you’ll quite likely end up wealthier. Tax knowledge, in short, can increase economic clout. You may wish to learn more about tax planning this tax season, or, ask your tax advisor to explain at what marginal tax rates your next dollars of income will be taxed. Next time: a look at marginal tax rates on various income sources. 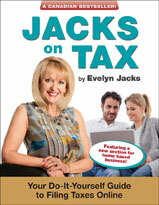 Evelyn Jacks is the best-selling author of 50 books on tax and wealth management and President of Knowledge Bureau. Evelyn’s books are available at www.knowledgebureau.com and better bookstores. To read more of her blogs, go to EvelynJacks.com. Who is Considered a Resident for Canadian Tax Filing Purposes? Knowing your residency status and tax filing obligations can save you from expensive penalties. For most individuals, the question residency for Canadian tax filing purposes is a straight-forward one. If you reside in Canada for 183 days or more, you’re a resident for tax purposes, and you must file a tax return if the taxes due on your world income less deductions exceeds your credits. The question of residency gets trickier when you spend part of the year outside Canada. Immigrants and emigrants are often referred to as “part-year residents” for tax purposes. Part-year residents are taxable on world income for the period in which they are resident in Canada. For the remainder of the year, they are taxed as non-residents. “Immigrants” become residents of Canada once they establish their permanent residency in Canada. “Emigrants” become non-residents of Canada once they establish permanent residency in another country. In short, an immigrant will file a tax return in the year of immigration and report on world income earned after immigration. An emigrant will file a final tax return for the year of emigration which includes world income earned prior to emigration. A departure tax will be applied to capital gains resulting in the increase in value of taxable assets as of the date of departure. Some people are considered “deemed residents.” This includes those who visit Canada for 183 days or more in the year, students studying abroad temporarily or members of the Canadian Armed Forces, those working in a foreign country under a program of the Canadian International Development Agency, or those who work as a high commissioner, ambassador, officer or servant of Canada, for example. Also included in the definition are spouses or children of those taxpayers. It’s Your Money. Your Life. Failing to file a tax return and paying your taxes on time can generate expensive penalties that erode your wealth and, in some cases, your health. Be sure you know your tax filing obligations, especially if you are not sure of your residency status. Author Evelyn JacksPosted on February 20, 2013 Categories Income TaxLeave a comment on Who is Considered a Resident for Canadian Tax Filing Purposes? Retirement income planning begins with the first dollar you save. That’s way RRSP season is important to young people, even though retirement seems too far away to worry about. But you should think about what lifestyle you are saving for and for how long your money needs to last between now and March 1, the RRSP tax filing deadline. According to Statistics Canada, an average 50 year old in Canada is expected to work until age 66 before retiring; 3.5 years longer than the 50 year-old who retired in 1993 at the age of 62.5, this based on 2008 data. Considering the average life expectancy is 79 for men and 83 for women, this means the average retirement period will be 13 and 17 years for men and women, respectively. That’s in a nutshell is what you are saving for. The big question is: will you be ready to fund your future consumption with the savings rate you have today? If not, you’ll need to decide how much of your lifestyle you are prepared to give up. Consider how much you need to save. In 2010, the average family income for elderly families was $56,200; for unattached elderly males the number was $33,800; females $28,500. The saving required to keep those levels of income up over 13 years for men, with a 2% inflation rate is $448,188; for women it’s more: $494,190. Those are big numbers. Yet, only 26% of eligible Canadians contributed to an RRSP last year, with a median contribution of only $2790 per year, leaving $633 Billion dollars of unused RRSP contribution room on the table—a figure that is not indexed for inflation. That is a shame, especially if you are young, because so much valuable tax deferred compounding time is being lost. It’s Your Money. Your Life. It’s clear: starting early makes a big difference; getting a great return on your investment does too. So does investing your maximum every year. Remember, the maximum allowable RRSP contribution per person for the 2012 tax year is 18% of your 2011 earned income to a maximum of $22,970; for 2013 the maximum dollar limit is $23,820 and for 2014 $24,270. To continue to have freedom of choice in retirement, go big on your savings plans. Evelyn Jacks: Who is Required to File a Tax Return? Do you have to file an income tax return this year — or can you just skip it for once? You owe income taxes on your balance due date. The Canada Revenue Agency (CRA) requests you file a return. You have an amount outstanding under the RRSP Home Buyers’ Plan (HBP) or Lifelong Learning Plan (LLP). You are required to contribute to the Canada Pension Plan (CPP) because of self-employment income. You are self-employed and opted to participate in the Employment Insurance (EI) program for self-employed taxpayers. You disposed of capital property or otherwise earned a capital gain. You elect jointly with your spouse to split eligible pension income. You received an advanced payment of the Working Income Tax Benefit (WITB). You are required to repay Old-Age Security benefits. To receive a refund of overpaid income taxes. To apply for federal refundable tax credits such as the Canada Child Tax Benefit (CCTB), GST/HST Credit or the Working Income Tax Benefit. To report capital losses for the purposes of reducing capital gains in the prior three years or to carry those loss balances forward to offset capital gains in the future. To qualify for provincial tax credits and benefits. It’s Your Money. Your Life. Filing a tax return is important because, by helping you recover overpayments of taxes and receive social benefits and tax credits, it will increase your income. Not claiming those valuable dollars is a sure-fire way to erode your wealth wealth and no one can afford that. See a tax professional if you are behind in your tax filings. Author Evelyn JacksPosted on February 6, 2013 February 6, 2013 Categories Income TaxLeave a comment on Evelyn Jacks: Who is Required to File a Tax Return?